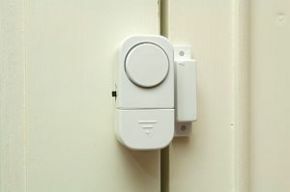 Magnetic Door And Window Open Alarm / Alert System. The magnetic door and window open alarm system can be installed directly on any door or window without additional wires. Fix the alarm unit to the edge of a door or window and the magnetic bar to the door or window frame. A loud alarm sounds (130dB) from the alarm unit, alerting a carer in the vicinity when a door or window is opened. Self adhesive pad included. Requires 3 x LR44 watch batteries (included and fitted).